Is It a Coin, Medal or Token? any newspaper and magazine advertisements features silver "coins" or "commemorative coins" honoring some event such as a space flight, the World Series or almost any other event or person. In reality, only government facilities can make coins. (In the case of some smaller countries, coins may be made by large private minting facilities such as the Franklin Mint in Pennsylvania). A coin is legal tender or, in plain words, "money." Most so-called "coins" that are advertised are actually medals. A medal is issued to honor a person, place or event and has no monetary value, even though some of these "coins" have a value in their legends, such as "25 Dollars" or "One Pound." The U.S. Mint issues medals to honor persons, places and special events. Every president is honored with a medal, often including the vice president along with inauguration date. Usually the medals are made of bronze and are sold at the retail outlets located at each mint. In many cases, versions in silver and even gold are made; the gold is usually one or two of a kind and given to the president and vice president. The U.S. Mint has produced hundreds of different medals over the years, covering a wide range of subject matter. A list of medals for sale can be obtained by writing to the U.S. Mint, Philadelphia, Penn. 19101. Anyone with the equipment and materials can make personal medals. About 20 years ago, one such company, The Patrick Mint, sold small medals (also called "medalets") about the size of a one-cent coin with a figure of Liberty or a similar U.S. icon on one side, and the name and business address of a coin dealer on the other. Many of these medals were used as business cards by the dealers who ordered them. Another minter, Toivo Johnson, issued a series of large medals featuring American coin designers on the front and their coin or coins on the reverse. Since they were quite large  more than three inches in diameter  they were not very popular. A limited number of medals were struck in silver. Today these matched bronze and silver sets, housed in custom holders, are highly popular with medal collectors and coin dealers. A common motif is the religious medal, found in various shapes and metals. Finally, a class of medals for performance includes athletic medals, military medals, show medals and many other categories. A token is a coin-like item that is made in struck metal, or any other material that has monetary value, but is not legal tender. The most common tokens today are transportation tokens used on many cities' buses. Some tokens are made of a plastic material and have a value imprinted on them, such as, "Good For One Beer." Tokens used at the casinos in Las Vegas and Atlantic City have a dollar value imprinted on them  but cannot circulate as money outside the casino. Tokens are classified by collectors into many categories including those already mentioned, as well as "Good Fors," sales tax, amusement, counters, ferry and bridge passage, railroad and subway, telephone, tavern and others. The feature that distinguishes the token from a medal is the exchange or monetary value. Some tokens are also commemorative in nature, such as tokens issued at the opening of a toll road or bridge. In the numismatic world, there is also a category of "non-circulating legal tender." These are coins made for a small country such as the Solomon Islands or Belize, but because of their high value, they are sold only to collectors and never circulate. Bermuda issued a $25 commemorative silver coin honoring Queen Elizabeth's 25th year as monarch. Although it can be exchanged at a bank in Bermuda for $25 U.S., it is a non-circulating coin. The standard catalogue for foreign coins lists such coins at the end of the regular series of coins under the heading, "NCLT," or non-circulating legal tender. Canada has issued a number of NCLTs in denominations of $50 and $100 in gold. These pieces do not circulate but are sold to collectors by the Canadian Mint and authorized distributors. The Franklin Mint has produced many such NCLTs for countries that do not have their own national mints. In the standard reference book on U.S. trade tokens of the 19th century (and late 18th), Russell Rulau has identified several thousand tokens used by various merchants and organizations  usually to facilitate trade, especially during shortages of small change from the federal government. 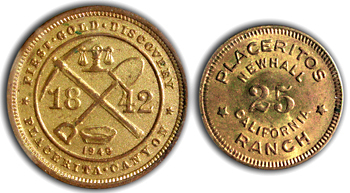 Many of these cent-sized bronze tokens were actually advertising pieces for businesspeople who ordered them made by various private die sinkers and mints. They are often referred to as "store tokens" or "store cards." A specialty group issued during the Civil War is referred to as "Civil War tokens." Some bore patriotic motifs, but most were store cards. The reference book on this specialty by George Fuld lists almost 8,000 different Civil War-era tokens. Another specialty is the "love token." In this case, one side of a real coin (usually) is planed off and something is engraved in its place, such as a name, monogram, date or message. Love tokens can often be found as a part of a bracelet or necklace. The most common love tokens are made from dimes minted between 1838 and the early 1900s. All other denominations are also known to have been made into love tokens, but for some, such as the $20 gold piece, only a very few are known. In terms of collector or numismatic value, many tokens have no value, and those listed in a reference guide such as Fuld or Rulau are worth anywhere from a few dollars to many hundreds of dollars. A very few rare tokens are worth more than $1,000  and usually only if in mint condition. Hopefully this will clarify what that odd-looking brass piece that has been in your dad's cigar box for nearly 75 years really is.